The all new BMW i3s, unveiled for the very first time at the Frankfurt Motor Show early this year (see details, photos and videos here), was recently reviewed by the Autogefühl. It’s slightly pricer than the standrad i3 (€3,600 in Europe and $3,200 U.S.) but offers better performance and looks a bit sportier. The battery remains the same 33.2 kWh unit as found in the standard i3. Autogefühl presents the exterior, interior and the driving experience of the i3s, noting that the i3s is super fun to drive, but the difference compared to the normal i3 isn’t all that big. The consumer faces a choice between slightly more comfort in the standard i3, or the slightly better acceleration of the i3s, which rides more harshly due to its stiffer suspension. 29 Comments on "BMW i3s Review – Autogefühl Video"
Glad there’s now more rubber on the front tires, that should help slalom feedback and speed. This is really underrated for how nicely it drives. It’s not a “puller” like the Leaf or Bolt, so, it’s front wheels don’t get that heavy Torque Steer feel. The steering is very light and responsive. It’s nice that it’s a “pusher” you can really hit the acceleration just out of a turn and use that torque. Would like to see the i3S with 19″ wheels though. Too many flats seem to be reported in the facebook group for the 20%. US roads aren’t really built for thin wall tires. I know I am in the extreme minority but I think it looks super cool and I love a good hatchback. I live in the EV desert of the midwest where there are EV islands so I’ve only ever seen one up close….but I loved the look. It’s pretty pricey but not for a BMW. It would seem its primary audience is people who already drive a $50,000 German car. Price varies quite a bit. 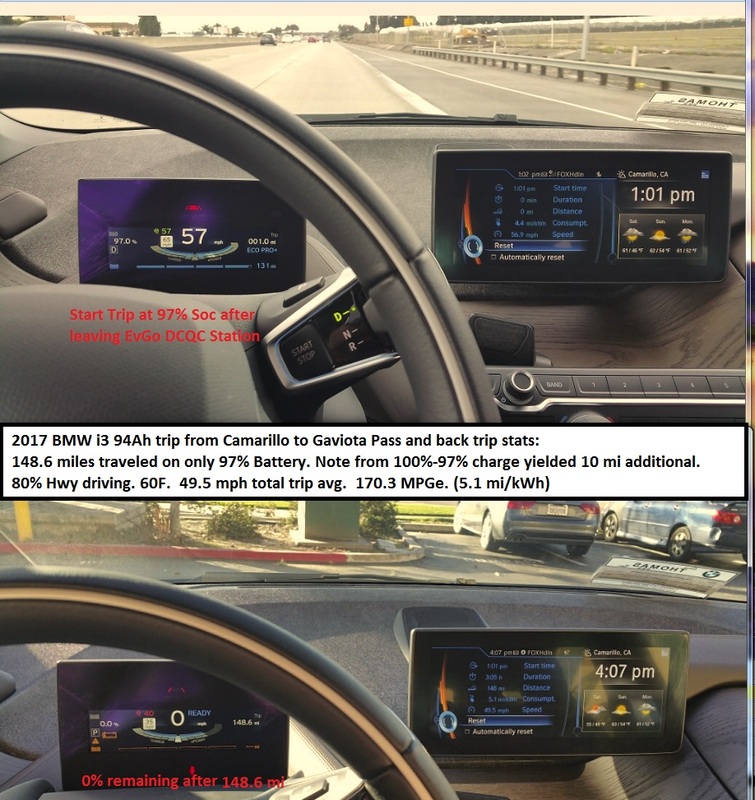 i3 BEV was recently available at one Southern Calif dealer for $189 mo, $2k down. SDG&E was sponsoring $10k off deal. BMW…1 step forward..2 steps Backwards….Going nowhere Fast..
I’ve owned a 3 and 2, 5 series all turn into junk after the warrantee expires..
Yeah… Sure… On this platform people always bought lots of cars from the brand they hate the most. And only had many problems with it, but for no reason kept in buying more and more cars from the same brand. The reference “i owned” on here in most cases is a lie to create credibility to a stupid worthless argument. Go and fool some other people. Well it’s a given that LMAOta is emphatically against anything BMW. I’m on my seventh EV, and it’s been all i3 lately. For those that are uninformed, I will say it again and will review some superlative factors of the i3 that can make it more appealing than some other seemingly obvious choices. Easy beats factory ratings in range and,acceleration. I have achieved almost 150 miles while maintaining almost mph avg. Have carried a 40gal water heater from Home Depot. Driver’s seat accomodated a 375lb man who couldn’t even fit in the,Bolt. REAR WHEEL DRIVE doesn’t spin or chirp under full accel even when wet outside. My Terra version is nicely equipped with leather dash trim and dark oak. Isn’t a dime a dozen common in sales number which is fine with me. Look at the latest siDE impact videos of how the i3 rood doesn’t even flex whiLe the Bolt bucoles with the dummies heads leaving imprints on the headliner. Refrigerant cooled battery can be chilled very quickly. Reverse engineering firm called the i3 one of the most advanced vehicles they have ever seen. Yeah, not such a bad after all. Most owners already strongly praise their i3 BMWs. You are telling a bunch of stories bro. You have no idea what he has done or why. Just because you cannot figured out how to use the doors correctly doesn’t mean you cannot open them in tight spaces because you can. Silly things people post. I can also site other reports where the i3 handily beat out the LEAF, Ioniq, and eGolf for a first place finish. And the higher EPA ratings the Hyundai submitted where no match for the lower rating of the i3. .
Those “quirky” 19 inch tires are a godsend on bumpy rough roads. The fact you only get 15″ on a Prius Prime for example, isn’t a good thing. -It rolls over bumps much easier than other cars, the ride is substantially better. -You can almost feel a dynamic stabilizing effect when these tire roll, gives the car a great sense of stability. “Quirky” in this case means non-standard and in the minority in car design. But, it’s clearly a Premium Feature. You sound as though a tall narrow wheel is innovative. It’s not. I wonder why tires have evolved over the years to get wider and sidewalls that are thin result in a harsh ride. BMW’s attempts at lightweighting resulted in strange solutions including narrow tires that also push less air as the roll at highway speed. Without always on traction control the ie would be even more skittery than it is. You show your lack of basic auto knowledge in saying narrow tall wheels are good, or even innovative. The S model tries to cure i3’s handling issues by putting a bit more rubber on the road, this reducing range and requiring more battery. Drive it yourself and you need no interpretation. Honestly do it. It drives great, it handles well, in cities it is the best possible, outside it is i would say quite good, not perfect, but good. The only downside i discovered so far are strong winds from the side on the autobahn. These are a little more difficult to handle than in cars with a lower roof. The thing is the i3 has so many new features that it’s hard to remember them. -Battery in the floor yields substantially quieter ride. Allowing you to enjoy great music in your drive. -The light weight body, which never rusts, gives the i3 a sports car ride, with great torque and instant speed. This is a break-away vehicle from the rest of the pack. As innovative as Tesla, for it’s role as a city/suburban car. 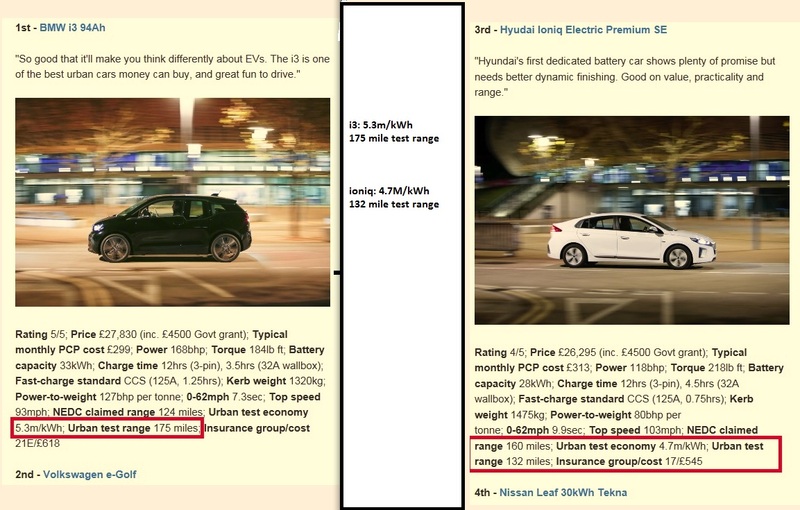 Clearly a Tesla would beat it on a track on or a highway, as it’s clearly designed as BMW 3,5,7 competition. But, the i3 is substantially better than 99% of the cars on the road as a fun commuter into and out of cities, and on country drives. Good observation on the i3 being an ideal environment to listen to music in, because when equipped with the Harmon Kardon sound system, it’s superior in clarity and accuracy than just about all the other EV system offerings. You must work at a BMW dealership. While an OK city car, watch reviews like the one above or several on YouTube and reviewers who relay that there isn’t much insulation in the i3 from road noise and wind. It’s shape blocks more then a sedan. Any electric car is quieter than an ICE at slower speeds but i3 is quite noise at highway speeds – noisier than other EVs. i3’s shape also makes it susceptible to be blown around in crosswinds. As does those tall narrow wheels. You BMW salesmen in here think we don’t read and watch consumer reviews. I have now driven both ReX i3 and BEV version with the older, smaller battery and the new. As a commuter, the car works well in the city. I even like the controls except cor that sliver of a readout in front of the driver. I was most impressed by It’s very short turning radius which comes in handy in the city. Add up all the shortcomings and oddities though, then consider the price and finally look at maintenance costs at BMW. There are just too many more sensible options out there. That’s incorrect. I did 110 mile trip last night to the convention center autoshow. Sure I hit some traffic, bUT left the active cruise control at 75mph. The car drives fine and is quiet at freeway speeds. Sat in more EV’s last night and learned some interesting things like the fact that my head almost hits the roof in the back seat of the Bolt. Furthermore, the side of the roof is so close to you in the Bolt you feel like you are in a small airplane. Who would have known the Bolt had less rear headroom than the i3? And what maintenance costs? BMW has free coverage for 3 yrs. Which as long as most people keep these anyways.Please stay factual. +1 on the HK sound system! Many times I find myself hopping in my i3 just to listen. Sadly, one of the weaknesses of the original i3 was its ride quality. I noticed it immediately on my initial test drive and had that reinforced on the 3 day test drive I did. Indeed, virtually every review notes it as well. Oh and before anyone heads down the “BMWs all drive firm” path, I’ve owned an M3 and and M5 and a couple other non M BMWs. BMW just got the suspension tuning wrong on this short wheelbase car (it was fun enough, but the ride got old…fast). Now, in fairness, I have not driven the current larger battery car which weighs more and I’ve heard rides a bit better (although most reviewers seem to note even it rides firmly…not as many reviews out there if the big battery car though). The i3s may reverse any gains made in ride quality. I expect it to be a rare bird regardless, as BMW doesn’t seem to be pushing the i3 in the U.S. and the i3s’ price premium will make it the rarest of the rare. Since apparently the utility of BMW “i” vehicles decreases with increasing number, can there be an i2 with 5 seats?